Where can you go for reasonably priced and high quality needlepoint stocking finishing after you have spent hours stitching your beautiful needlepoint canvas? We use an expert needlepoint finisher who has been in the business for over 30 years and who charges a very competitive price. 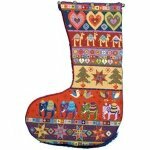 Needlepoint Stocking Finishing - What Is Included? Blocking the needlepoint back to its original shape. Cording, Welting, Tassle etc if requested (price additional). 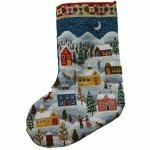 Email us at or call us on 1 877 722 8463 for a price for your particular needlepoint stocking finishing job. Our needlepoint stocking finishing prices start at US$ 75 for a basic knife-edge finish (no edging details). We also finish other needlepoint items like ornaments, bags, pillows and so on. We do not finish belt straps. Contact us for information about needlepoint stocking finishing.